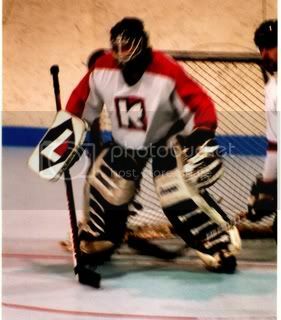 So, on top of taking a bazillion pictures (and loving it), I also love playing roller hockey and ice hockey (when I can). Just wondering if you folks could help me out? When I play hockey, I find that I the first shift I have a lot of energy, but in the shifts for the rest of the game, I find that my energy level just suddenly crashes to the ground. And I find myself muscles without any energy or drive. Now here's the catch. After about 40 minutes of overall hockey time (sometimes longer), I suddenly get a second wind and I can skate like there's no tomorrow!!! My normal routine to warm up is a few stretches in the locker room, followed by 5 minutes of warmup time on the rink floor (roller hockey). I drink a lot of water before and during the game (even drinking Gatorade an hour before the game). I eat about 3-4 hours before a game to make sure I don't get that nauseous feeling from food in your stomach rolling all over the place. I'm thinking that maybe I need to go for a good run before I even get my equipment on? But maybe it's something else. Any suggestions would be greatly appreciated! THANKS! I don't watch or play hockey, but couldn't resist this. Pace yourself. Limit shifts short shifts if you go all out. You will get all this acidic type stuff building in your body if you stay out too long on your shift. Maybe you are running on andrenaline if the first period. If it doesn't work... work on your cardio. My "ace in the hole" is I take 600mg of ibuprofen BEFORE the game. It's an anti-inflammatory and will keep your muscles from getting over-cooked when things are very strenous. I got the tip from my Dad who is a doctor, and now I swear by it. I'm no nutritionist or fitness expert - but how much exercise do you get besides hockey? I think your metabolism may be the problem. Here's my take: The first shift you're running all the sugar out. Then, since you may not be used to that type of workout, you feel down half the time. Then by when the game is 2/3 over you start burning fat calories real good instead of just running on the quick energy, and you feel better. 1) I guess if I play a full minute going full out, I'm supposed to feel tired, right? That's normal (if I'm pretty healthy)? 2) I think I still need to do a warmup where I get my heart beat going so as to prepare my heart for the workout that's to happen during the hockey game. Hockey is definitely way more intense than perhaps I've done in a while (especially league games). Do you guys think I should conserve my energy and just stretch before a game, or do a full 10 minute run a few hours or even just before the game? 3) I think I am out of shapre, as embarassing as that is to admit. But atleast I know I'm dealing with it. Planning to run more often, and do more strength training also. I think the muscle is there, but the transmission of the oxygen to those muscles probably needs more work? 4) I switched back to water only during the game just as the pre-season started (I ran out of Gatorade mix and had been using that for my scrimmages). Perhaps time to get back on the Gatorade instead of just plain water? PS: Probably going to do the interval workout. i think you're too drastic on your either 'nothing before the game but stretching, orrrr 10 minute run before the game.' personally, and this is from playing soccer for a while, you need to do LIGHT cardio exercises that will get your pulse up, but not drain your energy. not sure what you can do for hockey, but in soccer, ball taps, jumping jacks, and ball slaloms are decent ways to get your heart up without killing the rest of your energy. also, i'd also look into getting more gatorade in you, before the game, water during, then gatorade after. I play goaltender so there will be a few remarks about my relevance towards the subject of skating. I do know that water cannot be held in "reserve" in the body so drinking too much before a game is not all that beneficial assuming that you are already properly or normally hydrated. I only drink cold water during a game. Cold liquids are absorbed into the body quicker than say, room temperature liquids. I have also read more than a few stories that the sports drinks are no more beneficial to the body and it's energy levels than being properly hydrated with water or milk even. I am not saying you should drink milk during a game; I would not want to be the guy who cleans up your spewed milk in the third period. blurry vision but going to sleep as soon as my head hit the pillow. It looks like you are getting a few opinions and maybe someone has some good advice of thinking about running a little bit in addition. Hockey is good excercise and most times a great game to be a part of but unless you are playing four times a week, you may need additional excercise. But I still love all three. Work on your cardio a little more, 20 minutes a day on the threadmill, elliptical or bike will do wonders for your endurance. Also on hockey nights, carb-up on your noon meal (pasta or other high carb food) to store energy, and then have a light supper before the game. Stick to water during the game or water with 30-50% gatorade. Straight gatorade has way too much sugar. Thanks for all the advice so far. I played my first season game and, oh man, was it ever different! I felt more perky, a bit more energetic, more alert and not as out of breath as before (Although after quite a few shifts I was starting to gasp for air). 1) I started to run everyday that I can. My house is on a hill, so there is an uphill portion to my jog as well as a downhill portion. I usually start starthill and end going uphill. 2) I just recently started introducting fast-stop-fast intervals into my jog. So I would jog for a bit to get my body warmed up, then I'll sprint for a few seconds, come to a quick complete stop, then start sprinting again, come to a complete stop, sprint, and do this a few times usually until I'm tired or I hit a 'marker' (like a particular tree or lamp post). This is REALLY tough, and I'm pretty tired after just a few intervals. 3) I bought a Gatorade mix (about 50/50 Gatorade to Water ratio) and started drinking that just before and during the game. 4) Instead of doing a run as a warm up, I decided to do lunges and squats to hopefully activate my core skating muscles. I then follow it with stretches for the rest of my body (arm rotations, leg stretches, etc.). Hopefully this will allow my muscles to be ready to go, and will allow me to reserve my energy for the game. 5) I tied my roller blades to as tight as I could get them and found my skating to be more concise and less sloppy (there was more edge/bite, and I guess this was due to less movement within the skate itself). 6) I took a nap prior to heading out to the rink. 7) Sometimes I would take a 20% shift where I would only play to dump the puck down the ice/floor and then get off. This allowed me a bit more reserve energy for the next shift. I still found myself a little out of breath during the later shifts of the game, but I found that I was not burning out as badly as the previous games. I'm not sure which particular item helped me the most, but I'm sure that they all helped me out to some degree. Will continue to work on stuff and let you all know how things go. Yes it is no surprise that people who do not skate well tire themselves out in the process. I am not making any judgements upon you but you see some guys almost dragging their feet sideways and huffing and puffing. Just skate better and smarter most times and that will require less energy. I played last night as tornado sirens were sounding off. You will get some guys who want to play the defenseman when they get tired so they can "Cadillac" around the zone or playing the ''dumptruck" when they get the puck until line change. I use to dilute Gatorade with water as well. My goaltender trick was this. Get whatever water bottle works well for you and fill it half full with Gatorade or water and lay it in the freezer at an angle so the liquid freezes on one side of the bottle. Then at game time fill it with water. This way the frozen liquid keeps the water cool and if the frozen is Gatorade it is slowly mixing in. Granted it will be in greater and greater amounts. I mean we have all played in some very hot rinks (well maybe not so much you Canadians)and this was the best way for me to keep cool water ready when played had stopped. I always freeze water sideways in two water bottles; one for during play and one for after play. Don't freeze the water with the bottle standing up because then you cannot squeeze the bottle and liquid into your mouth. Just tilt it slightly in the freezer.